What’s the matter Parramatta? A lot it seems. Parramatta reverted well and truly back to the Eels of old in 2018, with yet another wooden spoon in a year of on-and-off field turmoil for the battling club. The combination of Mitchell Moses and Corey Norman went backwards, the return of Jarryd Hayne showed they should just never have bothered and they lacked the luck and mental fortitude needed to close out a slew of tight games during the year. They were never coming back from a 0-6 start, and their few good showings throughout the year frustrated their long-suffering fans more than anything. The 2019 season couldn’t have started much worse for Parramatta, either, with the Jarryd Hayne soap opera rolling on off the field and the shock departure of Corey Norman to the Dragons that has thrown a spanner into their preparations. It’s not all bad, though. They’ve made some very handy purchases, headlined by Blake Ferguson who comes in fresh off a big year for the Premiership-winning Roosters and will provide some valuable flair and experience at the back. Big man Junior Paulo returns to the club he began his career with to give some size and mongrel to a forward pack that badly needs it. And perhaps the most interesting acquisition is that of backrower Shaun Lane, who joins his 4th club in five seasons (yes, that is not a typo) hungry to settle into a regular starting spot to show off his immense attacking potential. Lane, by all accounts, comes to the club with a tremendous attitude, at a time when the Eels need level heads. It’s exactly the kind of signing that can turn a club around and lift those around him out of a rut. Plenty of SuperCoaches will have their eye on him when he gets his chance. The makeup of Mitchell Moses’ halves partner is also sure to attract attention during the trials, with rookies Dylan Brown and Jaeman Salmon looking to lay their claim to the #6 jersey for their Round 1 opener against the Panthers. Two young guns battling it out can only be reinvigorating for a club where combinations were far too disjointed last year and these kids have plenty of wraps on them. There’s no doubting that the Eels have class in key positions this season, but the combination of inexperience and out-of-form first-grade regulars is what drove them to such a poor finish in the last season. The loss of big-names Norman and Hayne might just be what the doctor ordered to shake things up, though, with a completely revamped attacking structure on the cards and plenty of pressure on Mitchell Moses to make it happen. It’s not an easy start to the season for the five of their first ten games against 2018 finals sides and matches against 2019 finals contenders in the Knights and Cowboys. Their opening month, in particular, looks tough with games against the Panthers, Roosters and Sharks. 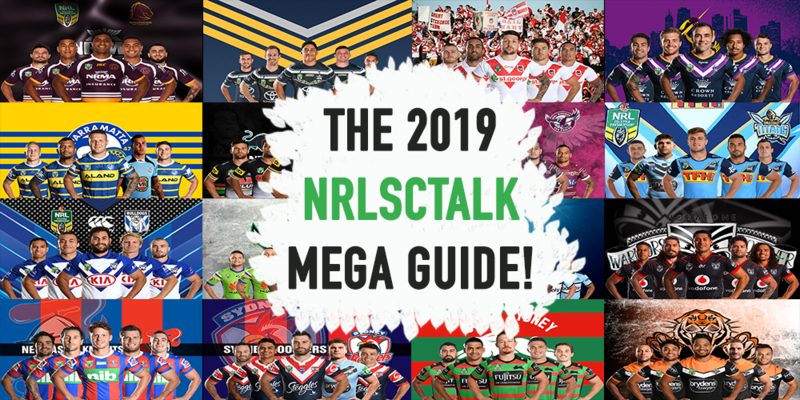 The NRLSCTalk Mega Guide is now available for purchase and we have just released our first update, which has a stack of updates and improvements – including an update to over a dozen players. For just $12.99 you receive over 130 pages of detailed analysis on every club and player listed in the club. Click on the below image to buy your copy now. Manu Ma’u wins back his dual position 2RF/CTW status in season 2019, and this will be gold for SuperCoaches if he can maintain his regular 80-minute stints on the field. That’s the big question mark, though, with huge wraps on the newly-signed Shaun Lane arriving at the club and Marata Niukore staking his claim to the second-row spot with some strong performances in his debut season. This could spell disaster for SuperCoaches, as Ma’u doesn’t have the work-rate to make up for a loss in minutes, averaging 0.85 PPM last season and 0.7 PPM the year before. This is partially due to persistent injuries in the Eels backline meaning he has occasionally had to shift to the centres mid-game which has dropped his output in a big way. He missed the second half of 2018 with a horrible cheekbone injury suffered in June and has also undergone shoulder surgery in the offseason that has delayed his return to training until January. It means that there are plenty of unknowns surrounding Ma’u, but his pedigree in the game where he regularly pushes out big scores (his 2018 was a career-best 63 PPG in an otherwise horrible Parramatta side) could be vital if he comes down in price in the CTW position. Nathan Brown’s 2018 season was ruined by mid-year injuries as he was never quite able to build on the numbers that brought him to the attention of SuperCoaches in his breakout 2017 year where he hit 65 PPG in an average of 67 MPG. He was still very handy when he was able to get on the park, with 55 BPPG stemming from his powerful running game and defensive work-rate. The offloads he was renowned for in 2017 were a little down, throwing just one on average per game (1.5 in 2017), but a lot of this comes down to the pressure Parramatta were under making it out deep from their own end meaning Brown had to turn the flair down a touch. He’ll again take on a leadership role in the Parramatta forward pack this season, surrounded by new faces and some fresh ones on the bench, and if he can stay healthy, he’s sure to return to the power game that makes him so valuable in SuperCoach. Coaches should be a little wary of him to start the year, with a pre-season knee injury sidelined him for a fair chunk of December and January. Shaun Lane is truly a SuperCoach sleeping giant, with the towering second-rower having the ability to push out 80-minute games and a wealth of attacking stats to go along with it, but never being given a chance to do this regularly. He averaged 1 PPM in his 24 games for Manly last season at an average of just 54 MPG. In his first 16 games, he played just the 5 matches where he was on the field for more than 55 minutes. After the round 17 bye, he exploded, with a huge 75 PPG from 65 MPG to finish the year that sets him firmly in the sights of SuperCoaches as he makes the move to the Eels who desperately need some spark in their second row. His ability if given time is well-known, but there are question marks about where exactly he fits into the Eels’ rotation here. They are heavy on second rowers and Manu Ma’u has been pushing out 80-minute games on an edge for a few years now. His relatively low price in the position (compared to his potential for more) and dual position status make him an attractive option, but it remains to be seen whether he can finally bump up the all-important minutes that will see him reach the 60-65 PPG average that will elevate him to keeper status. Much like the Parramatta Eels of 2019, Clint Gutherson’s form fell off a cliff after a breakout year in 2017. It’s hard to put this down to any one issue – after all, his first game back from an ACL injury was Round 6, and his attacking stats went missing along with his teammates’. Gutho’s BPPG was very reasonable at a shade under 30 (2017: 24) by sheer virtue of the fact that he just loves running the ball. This was enough to see him ranked 18th across the CTW position for base (10+ games), but base was never the selling point for him to begin with. The alarming stat for owners is that he didn’t even make the Top 40 CTWs for average points for the year and was a mile off the pack in attacking stats after being one of the most potent in 2017. A fair bit has changed for him heading into this season, though. He’ll be starting afresh with a full pre-season under the belt training at fullback, where he’ll be a focal point in attack with the loss of Corey Norman. He’ll also have the chance to link at the back with star recruit Blake Ferguson adding some potency to a backline that was listless last season. His starting price of $440k is also well down on his breakout 2017 where he nudged $600k in the same position. He’ll need Parramatta to lift but there’s no doubting his class here. Junior Paulo had a real struggle for minutes in his 2018 season with the Raiders, dropping from the 50-60 MPG mark of previous seasons to a lowly 40 MPG, as he drifted in and out of the starting side regularly. He’s likely to find more time and consistency in a move to Parramatta, whose forward stocks were in desperate need of bolstering. Unfortunately, the SuperCoach gurus have noted this, and his price tag has been inflated to a difficult $407k to start the year as a result. This puts a dent in his potential to generate handy cash in the early rounds, but he’ll have no trouble doing this if he can find a way to stay longer on the park. With the Eels expected to carry a three-forward bench and the ageing Tim Mannah part of the prop rotation, Paulo might just have the ability to do this at his new home. He could be a great stepping stone to a gun FRF option mid-year. Those who climbed aboard the Mitchell Moses rollercoaster at any point in season 2018 were treated to plenty of stalling, idling and the occasional peak that made the thuds back down to earth even rougher. It was enough to make many rubberstamp him as a ‘Never Again’ option. His horrible year was capped off with a hilarious score of -7 points courtesy of a sin-binning against the Roosters in another drubbing for the wooden spooners. Redemption, though, might not be too far away. With the departure of Corey Norman to the Dragons in the offseason, Moses and a rookie half will now be steering the ship for Parramatta, which means Moses is likely to be involved in a big way in the direction of this side. Two scores last year of 134 and 137 (and 3 scores of 110 late in the 2017 season) show just what this guy can do when he’s on, but it’s his tendency to drift out of games and string plenty of sub-50 games together that will be of biggest concern for SuperCoaches. Goalkicking duties, a healthy Gutherson and Ferguson to work with and chief playmaking responsibility makes his current price tag look very juicy for a player of his potential. An uptick to a more respectable 50PPG which he’s certainly capable of will see him generate some early season cash, but owners will be hoping for more from a guy who has keeper potential. Ferguson finally broke through into the gun CTW brigade last season, on the back of a formidable partnership with Latrell Mitchell in the Roosters’ premiership year. Tries and linebreaks rained down for the winger who had previously floated around a frustrating 50PPG average. Outside of these attacking stats, his BPPG was top of the class for (non-dual 2RF) CTWs at 36 BPPG, due in part to some heavy involvement running it out of the back as teams kicked to the Roosters’ flanks to steer clear of James Tedesco at fullback. He joins a Parramatta side this year, and this might spell a little bit of trouble for him, as he has figuratively gone from the penthouse to the outhouse in terms of his team’s attacking ability. It means he runs a huge risk of his attacking stats drying up, even if he can maintain his huge BPPG as a leader in the Eels’ backline. One has to put that 2018 year into perspective, as it would be a brave man to back Fergo to maintain that 65 PPG average that puts him above $610k and likely out of reach for most Round 1 sides. The enigma that is Bevan French starts the season unlikely to crack the top 17 which is an alarming slide for the attacking weapon. He had some truly awful games at both his preferred fullback position and on the wing last season for the Eels, with just the one game where his base points cracked 20 and one game where he scored more than 50 in total. That is a terrible output for SuperCoaches when there are plenty of options in this position who offer a much higher floor in better attacking teams. Something doesn’t seem right here, but with an average of 44PPG in 2017 at the fullback position (excluding an injury-affected 5 point game to close the year out), he might come into calculations purely on price if he’s thrust there at some point during the season. Otherwise, best to not get lured in here. With plenty of wraps on him in the pre-season last year, Salmon finally made his debut in Round 21 and played out the rest of the year. He started 3 of those games in the #6 jersey, and churned out a mixed bag, with scores of 52, 38 and 21. It’s fair to say that being thrust into the wooden spooners with the worst attack in the league was never going to be easy, so it will pay to look beyond those stats last year and the potential he is renowned for. He has a huge opportunity this season with the departure of Corey Norman freeing up a spot with Moses in the halves and will be fighting with fellow rookie Dylan Brown to fill the void. Early indications are that Brown may be leading the race here, but whichever way it falls, SuperCoaches have a cheapie halves candidate (and also CTW for Salmon with his handy dual) to lock in early. Dylan Brown has been all the rage during the preseason, with talk that he is in line to make his debut in Round 1 partnering Mitchell Moses. This would be absolute SuperCoach gold, with a rookie half with dual flexibility at both HFB and FV8 priced at bottom-dollar. Standing in his way is fellow rookie Jaeman Salmon, who played the five games in the position last season. Should Brown get his break, his stats from a very limited 2018 Intrust Super Cup season show that he possesses a pretty handy SuperCoach game – 100+ average running metres, one forced drop out per game and a sprinkling of try and linebreak assists. He’ll take a back seat to the likes of Mitchell Moses and Clint Gutherson in attack, but even at an average anywhere from 30-40 PPG, he’ll be a must in all Round 1 SuperCoach sides. I’m tipping Fergo to be a mid to late season gun POD, much like Hayne was at the end of last year. I thought this team was relocating to Fiji. Its unbelievable the Moses offers good value again. Lane and Gutho have decent upside and 2 good rookies. I really see the eels struggling this year once again. From an SC side of things keeping an eye on Mahoney, Lane and will take a second look at Paulo should he have another good trial. The makeup of the bench is so important. I have concerns about the Eels this year. There attack didn’t look that great the other night and then lost a 20pt lead. Yes only trials but not a great sign. I am going to be watching Lane very close next trial and hope we can see if he will play on that right edge for decent min and that Moses actually passes him the ball!